The H2OPM Image Registration Dataset is a dataset for the evaluation of (groupwise) registration methods. It consists of 8 reference ortho-photo maps (OPMs) of urban and non-urban areas in Austria. 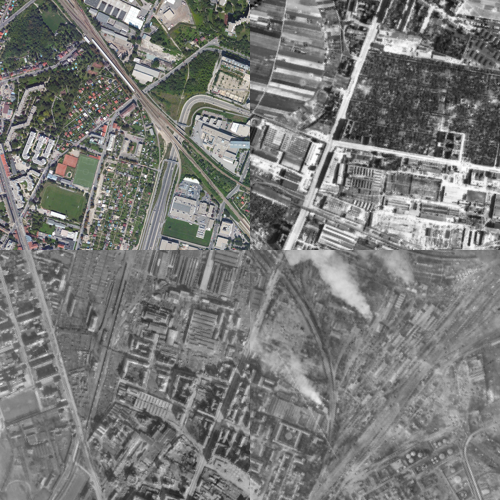 For each reference image, 3-11 historical aerial images captured between May 1943 and May 1945 are available, leading to a total of 42 image pairs. In order to evaluate the registration accuracy, manually selected ground truth correspondences between the historical images and the OPM are provided. The dataset is freely available for non-commercial research use. In order to get access to the dataset you have to fill in and sign the usage agreement form and send it to Sebastian Zambanini. All images have been scale-normalized to a spatial resolution of 1m . However, for the historical images scale information could only approximated, the actual scale of the images might be actually off up to 30%. Reference OPM images are named “ref_i.png” (i=reference image number, 1..8). Corresponding historical images are named “image_i_j.png” (j=historical image number). For example, “image_2_4.png” is the fourth out of five historical images that could be registered to reference image “ref_2.png”. Ground truth control points are given in the text files “CP_i_j.txt”. Each row of the text file describes one control point pair with values x1,y1,x2,y2. The origin of the coordinate system is the top left of the image, x-axis points right, y-axis points down. Please cite this paper when publishing results on the dataset.